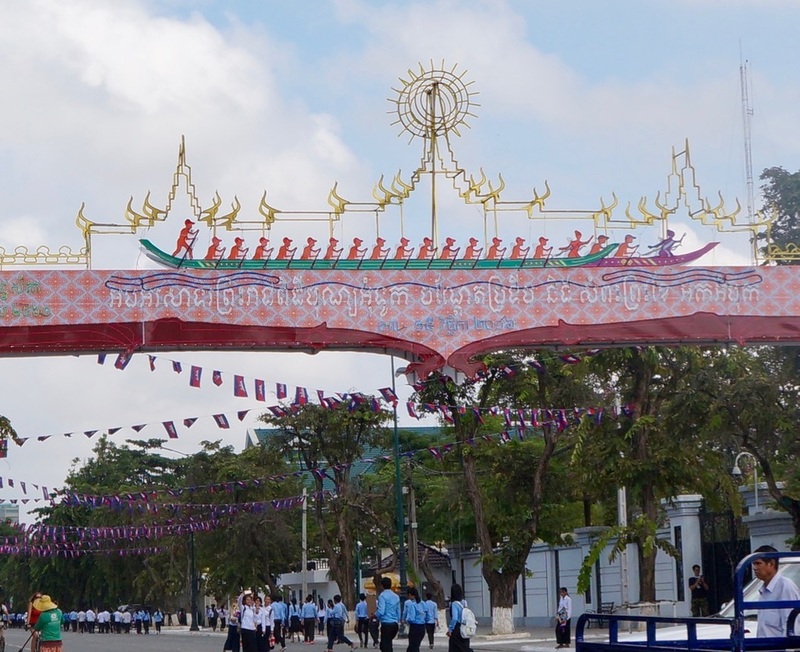 Cambodia has so many attractions and activities ongoing almost all year round but in November each year, there is one absolute Everest of festivals, Bon Om Touk or Water Festival, that shuts the town down and opens the rivers to a fabulous spectacle. Boats in the Water Festival Race. 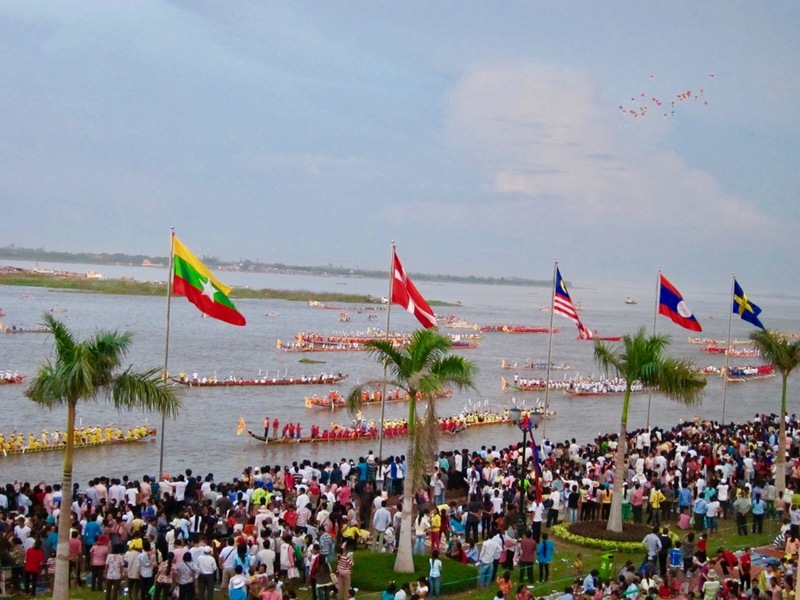 The heart of the water festival is the celebration of the reversal of the flow of the Tonle Sap river. Celebrated on the Full Moon or what the Khmer refer to as Kadeuk, candles and incense are lit and offerings of flowers, fruits and special food especially the Khmer delicacy, Fish Amok, are made to thank the gods. But the event that gets the most attention is the 3 days of boat racing from the Japanese Bridge to just by the Royal Palace. With paddlers and oarsmen from every Province joining a team to show their mettle, imagine long narrow open canoe type boats with 72 paddlers stretched down the sides or slightly wider craft with 50 oarsmen kneeling at their locks ready to do battle. From the balcony of the old Foreign Correspondents Club, where the western journalists gave a final farewell to Pol Pot, foreigners gather with an icy beer to watch the fleet tear down the Tonle Sap. 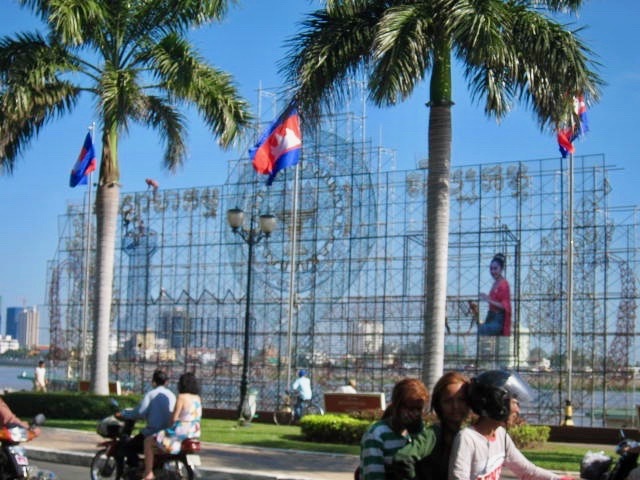 ​In front of them hundreds of thousands of Cambodian have picked their favourite boats and are waving coloured scarves as they cheer for their heroes. The sailors are all amateurs but they practice a good part of the year to keep their provincial good name. Famous politicians have their own boats as do several government Ministries and a few of the big corporations so this is warfare on the water. Day 1, most things go well. Perhaps, one of the last lucky boats flips and the emergency crews come tearing out from the shores as first responders. By the second day, the lads are getting tired and occasionally some doofus misses his stroke and the chaos of 72 flailing paddles ensues. By the third day, the boys are a bit ratty after two nights of serious beer, 3 days of broiling heat and the exhaustion of savage competition. So, this is the day to be watching, Championship Day. The disciplined crews, of course, wins and the rhythm of their effort leaves the boats looking for all the world like giant millipedes with the perfect harmony of paddles taking the place of little legs. And so, there will be winners and a number of clashes and increasingly, there are women competitors showing their strength as well and the after glow of the water festival will settle over Phnom Penh as the weary thousands creep back to their villages to recover, repair their boats and dream of next year. 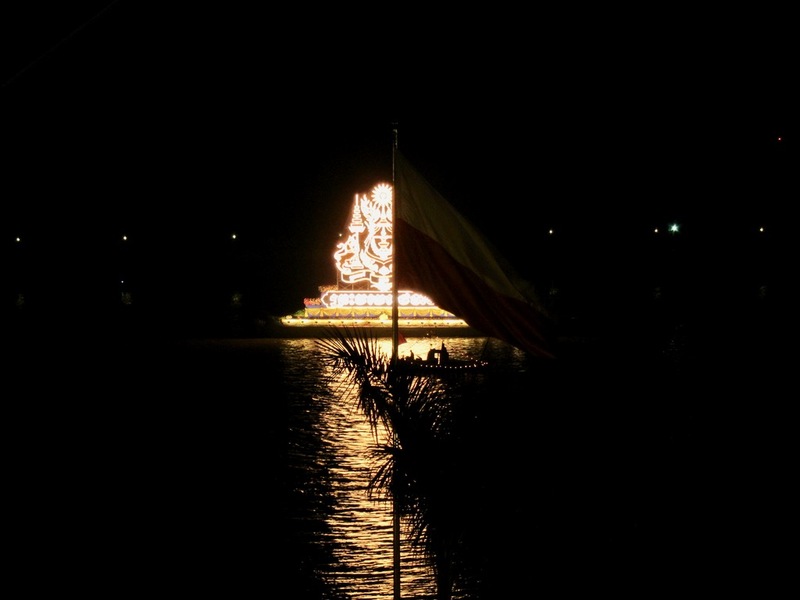 In this picture is the illuminated boats that cruises through the river and with the nightly fireworks give magic to the celebration. 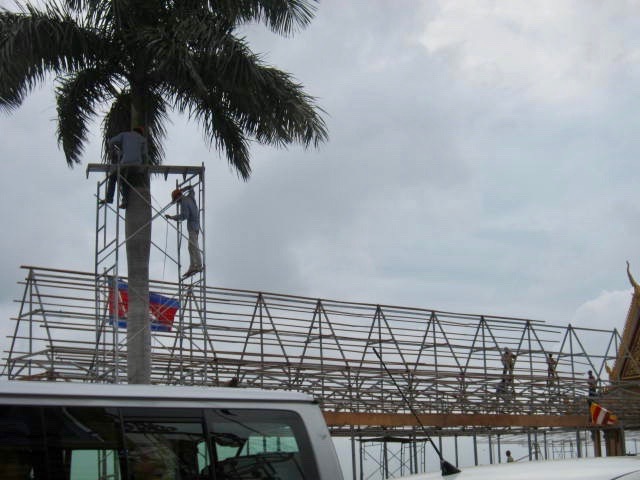 Preparations for this year's water festival include the building of the viewing stand. Of course, participants have been practicing. 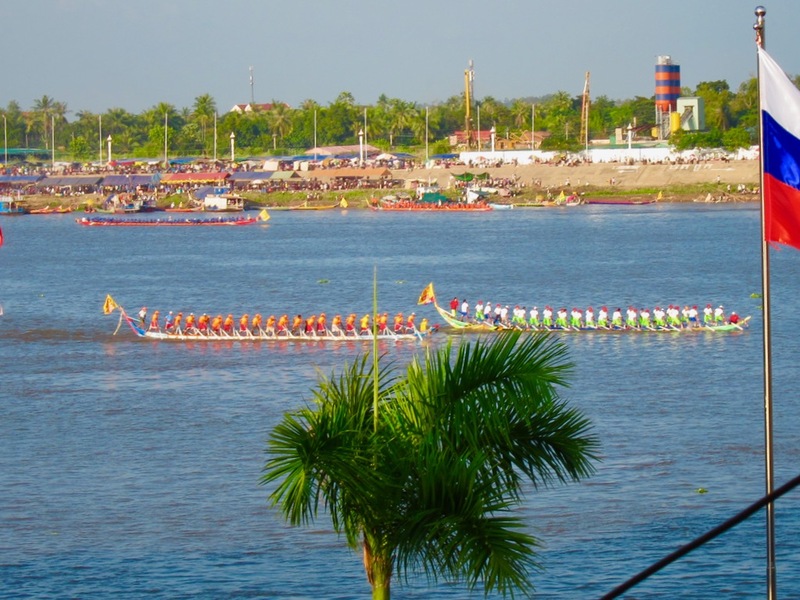 In fact, there were some mini boat races in some provinces to practice for the event and hone the skills of the oarsmen. 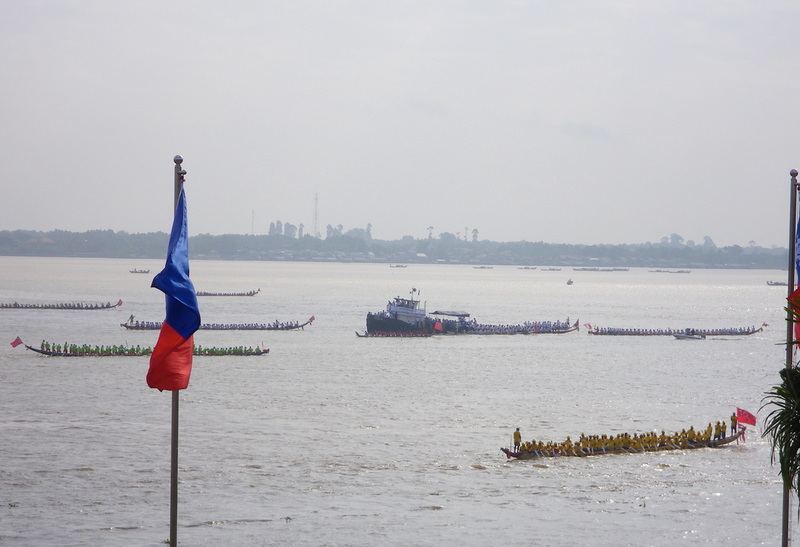 This morning, on the eve of the water festival, Cambodian boats were out in the river practicing their paddling. In the riverside, the lanterns are ready, each one sponsored by a Government Ministry or the private sector. 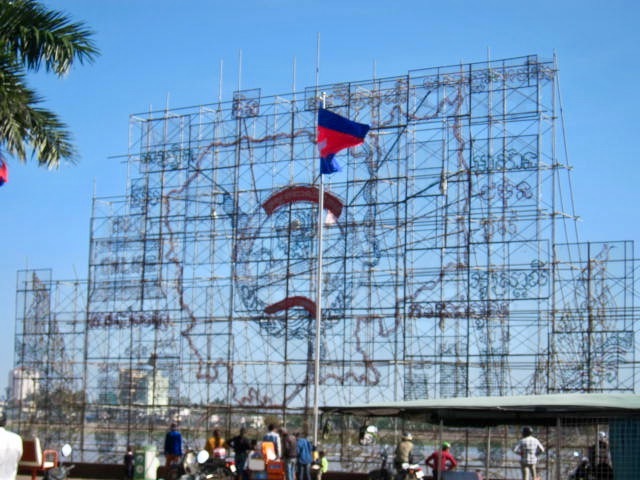 Some show the map of Cambodia, others show a different aspect of Cambodian culture. 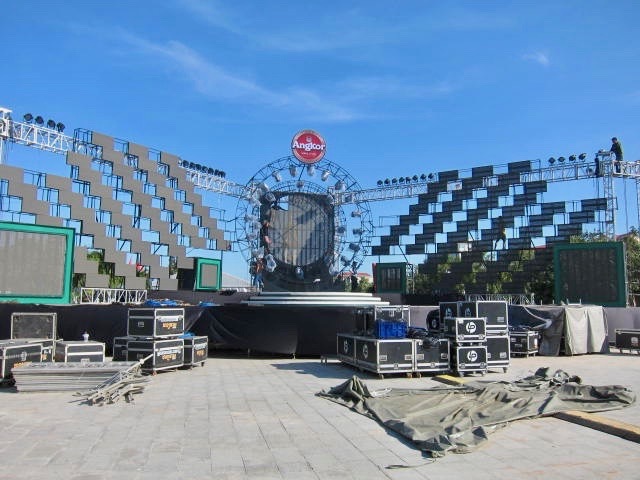 The stage is being prepared for the concert. Not just 1 but 9 stages. This one is in the Cambodian-Vietnamese Friendship Wat Botum Park. Leave your cars and motorbikes and put on your walking shoes as walking is your only way to the festival grounds.